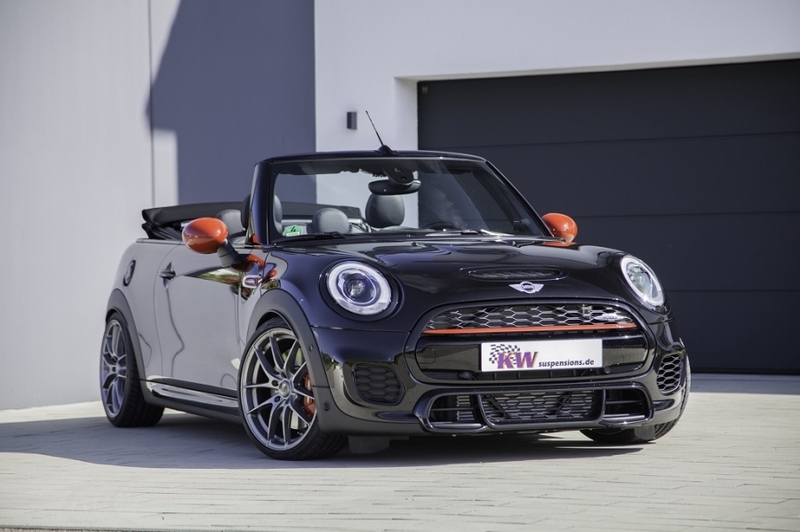 For the latest Mini John Cooper Works Convertible with its 231 hp strong turbo four cylinder engine, the suspension manufacturer KW automotive has already developed four coilover kits. Depending on the version, they enable a tested lowering of 20 – 45 mm at the front and rear axle. Besides a continuous lowering, the suspensions made of stainless steel feature even more advantages. By the increased handling and the shorter braking ways, also the vehicle safety is increased. In case the sporty setup of the Mini John Copper Works series suspension in the convertible is damping too harsh on bad way roads or if it is too hard in everyday life, the KW Street Comfort suspension is the ideal alternative. Besides a continuous lowering of 15 – 35 mm it convinces by its comfort-oriented setup. The spring rate and the damping version are always designed for a harmonious cruising without that the handling suffers at fast load changes. In addition, it offers the option to further adjust the damping more comfortable or tighter. 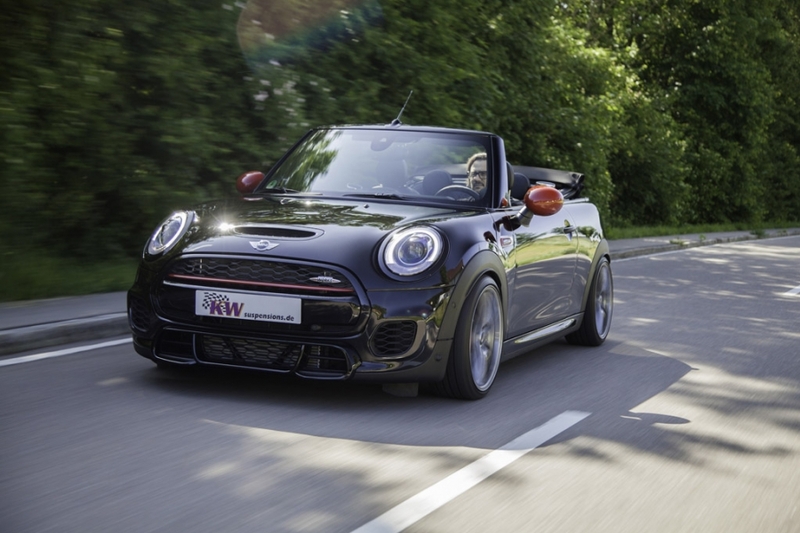 If someone wants to get a significant plus in driving dynamics of his JCW convertible without having to accept a loss in everyday life, we recommend our KW coilover kits Variant 1, Variant 2 and Variant 3. The Variant 3 with its independent damping technology adjustable in rebound and compression damping is the most demanded coilover kit for the Mini. During a 22.000 km long world tour of a Mini (F56) in summer 2014, the V3 proved its everyday practicality even at the most unfavorable circumstances. If the rebound that is adjustable with 16 clicks is opened, the driving comfort is increased. When closing the rebound valves, a stiffer setup can be reached. “If for example low profile tires with runflat are mounted it is possible to minimize the hard rolling of the tires on bad roads by changing the rebound damping. With the KW coilover kit Variant 2, this is also possible. The Variant 3 additionally features an adjustable compression damping. Herewith the drivers get the scope to consider the wheel characteristics of high and ultra-high performance street tires. With the adjustable compression damping a targeted influence can be taken on the body roll and nodding movements within the driving dynamical limit as well as on the tire grip. 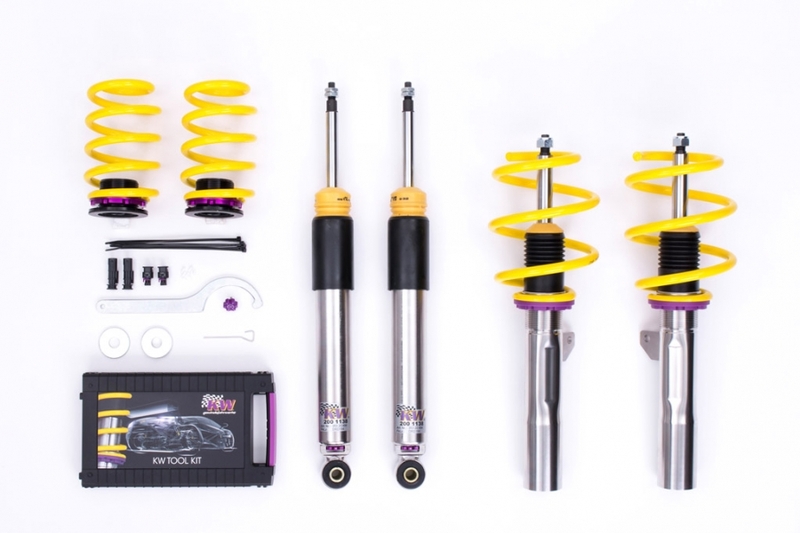 The KW coilover kit Variant 1 also has a sporty harmonious damping adjustment but it can´t be further adjusted.